Just about everyone snores occasionally, and snoring can lead to interrupted sleep. A few disruptions may not seem that serious, but if you snore regularly and if your snoring turns into sleep apnea, it can have adverse effects for you and your partner. There are numerous types of anti-snoring devices available on the market and some work better than others. While some methods work well for snoring originating in the throat, others have been proven effective for snoring that is more commonly resulting in the nasal passages. Nasal dilators come in a variety of types including in-nostril stents, external strips, and in-nostril cones. They are designed to open users’ nasal passages. By opening the nostril, the dilators reduce symptoms of snoring, colds, allergies, congestion and even a deviated septum. The best products on the market are made from medical grade materials for comfort, and they are the easiest to keep clean. Each person’s nose is a different size so choose an adjustable product or experiment with several sizes of an appliance to find one that fits your nostrils. Nasal dilators work to open the pathways that are typically blocked by snoring. They keep the nasal passage held outward and expanded allowing more air to pass through. They also widen the nasal passages during sleep to help you breathe more efficiently through the nose. In some cases where there is collapsing of the nasal passages during sleep, the nasal dilator prevents the nostrils from closing. If the nasal passages are congested due to allergies or a cold, the nostrils are inclined to close. Nasal dilators stop this from occurring. If you are thinking about trying a nasal dilator, NasalAid, available from Respitec is an affordable solution for your snoring and sleeping problems. It is a high-quality, reusable, compact, flexible device that is worn inside the nose during sleep to prevent the nasal passages from collapsing. Many people have experienced better sleep because of this product. The physician-recommended NasalAid costs $19.99 and has a lifespan of around ten years. 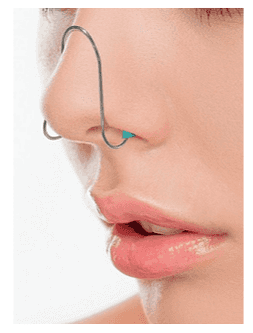 NasalAid is fully adjustable and easy to insert inside the nose, and it stays in place throughout the night. It is made of medical grade steel and silicone tips. The silicone is so soft you will forget you are wearing the appliance! Respitec is currently working on making a new appliance so the entire device will be constructed of comfortable medical grade silicone. When using the NasalAid for the first time, use a mirror to help you position it correctly. You can review a video of how to use and adjust the product here. Many reviewers have enthusiastically commented on NasalAids effectiveness when compared with nasal strips because there is no adhesive stickiness to deal with. Noses come in different shapes and sizes and play an important role in an individual’s health and wellbeing. Treating nasal issues is pivotal to resolving sleep and respiratory issues. Using a product that is sized for your nose is most effective. Use the NasalAid every night for at least two weeks so your nose can become accustomed to the shape and feel of the product. The NasalAid can be used in tandem with other anti-snoring devices such as mouth guards, TRDs, pillows and even a CPAP machine. Clean the NasalAid after every use with mild soap and water. If you or a loved one suffer from snoring, sleep apnea, allergies, sinus infections or nasal congestion consider investing in an affordable device such as NasalAid. Nasal dilators are inexpensive and don’t need to be replaced as often as some other anti-snoring products. The low-cost Respitec is the longest lasting nasal dilator we’ve seen. It is discreet and tends not to stick out too much when you’re wearing it. You can also wear it during the day to combat seasonal allergies, eliminating the need for nasal sprays or medications that may cause drowsiness. The Respitec is simple, small, and portable so you can use it anywhere. It is a convenient option if you are a frequent traveler. Most come with a small carrying case making it easy to pack or store when not in use. Some people find nasal dilators to be uncomfortable and invasive. Enough so to cause them to have trouble falling asleep. There is an adjustment period just as there is with any anti-snoring device. It is suggested you give it at least a week to become acclimated to the device. The benefits far outweigh the initial discomfort. Nasal dilators don’t work for everyone. In cases where the snoring originates in the throat, nasal dilators cannot relieve or eliminate the snoring issue. Nasal dilators can only open the passageways in the nose. Snoring mouth guards like SnoreRx, Zyppah or ZQuiet can help eliminate snoring that comes from the throat. Will a Nasal Dilator Work for You? If you find yourself snoring, suffering from sleep apnea or are congested and you feel the cause is in the nasal pathways, then a nasal dilator is the perfect product for you. There are multiple uses associated with nasal dilators. They have been effective in reducing sleep apnea, snoring, and seasonal allergies. You can use them with other anti-snore devices such as CPAP. Nasal dilators will not work for everyone, but they do help a lot of people who struggle with sleep and snoring disorders.